Well hello there. Yes, I know it’s been a long time since I’ve said good day to you all. You know when life gets messy and you just can’t fit another thing on your plate? That’s what’s been going down in my world. I hope you’ve been eating well, things are looking a little thin around here. I’ve had a major life re-vamp during my hiatus but I assure you, all is well – slowly but surely. I’m eating less junk, more healthy foods; drinking less beer, exercising a little (need to up that) and wrestling my health issues to the ground this week with a few appointments. All this around several deadlines. It’s been busy busy busy. But I am back! All with a little kick up the bum from blogging freak (and I say that with love, affection and jealousy), Jeff Goins. I’m taking part in his 7-day blogging challenge. Day 1 (today) was all above setting the theme of your blog and publicly announcing your intentions and goals. I wrote my manifesto à la Kelly Exeter style (her’s kicks mine straight to the curb but I’m still a little proud of my efforts) using Canva. I heart Canva. Tell me what you think. And don’t hold back. My skin is getting thicker by the minute! Sometimes it’s hard to walk, it’s so leathery. Do you have a manifesto for your life/blog/career/health? Share it in the comments. 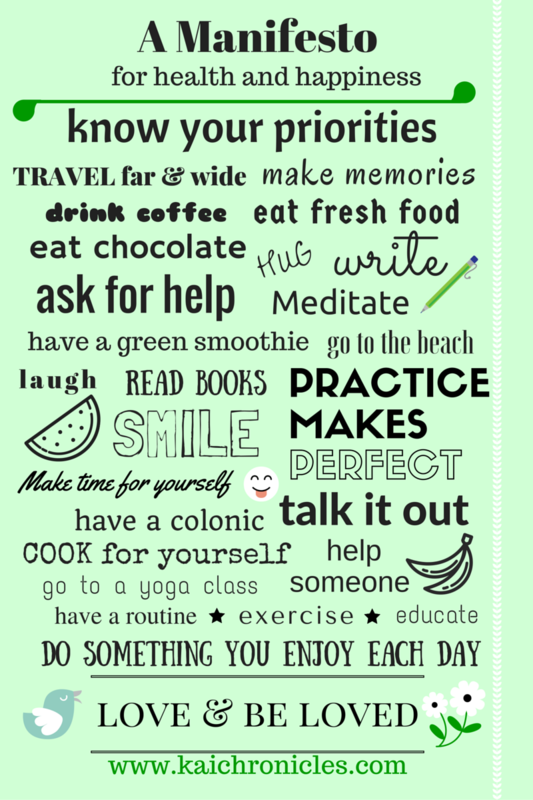 Categories: Fitness, Food, Health, Travel, Wellbeing | Tags: manifesto | Permalink. Thanks Brooke. I totally agree. Keep an eye out for my upcoming ebook that talks about this very topic! !